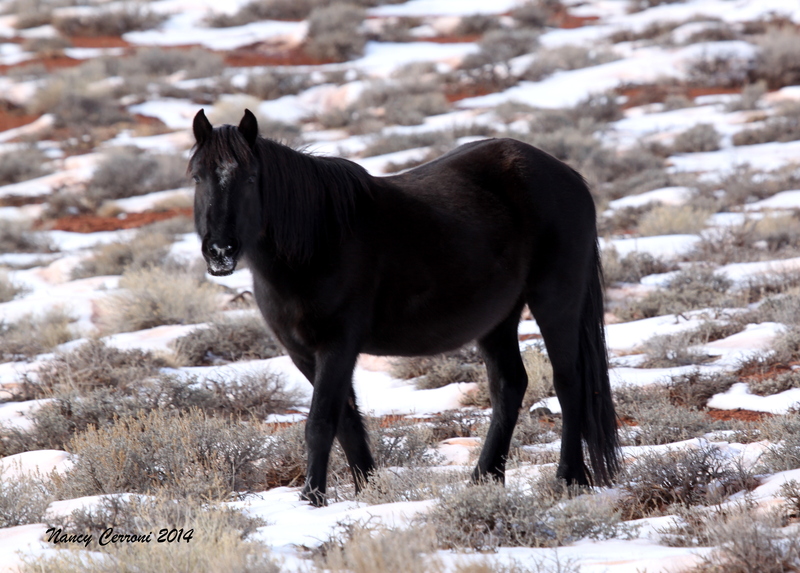 Another Arctic blast is currently hitting the Pryor Mountains . This winter has definitely been one of snow, wind, and cold. 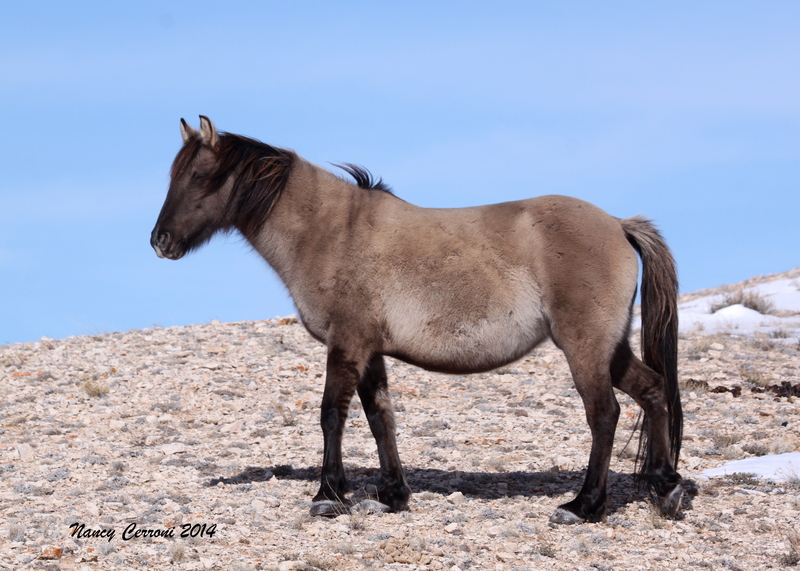 The Pryor horses have endured winter for hundreds of years. However, when a year like this hits, we can only trust in their history and their perseverance for them to endure. 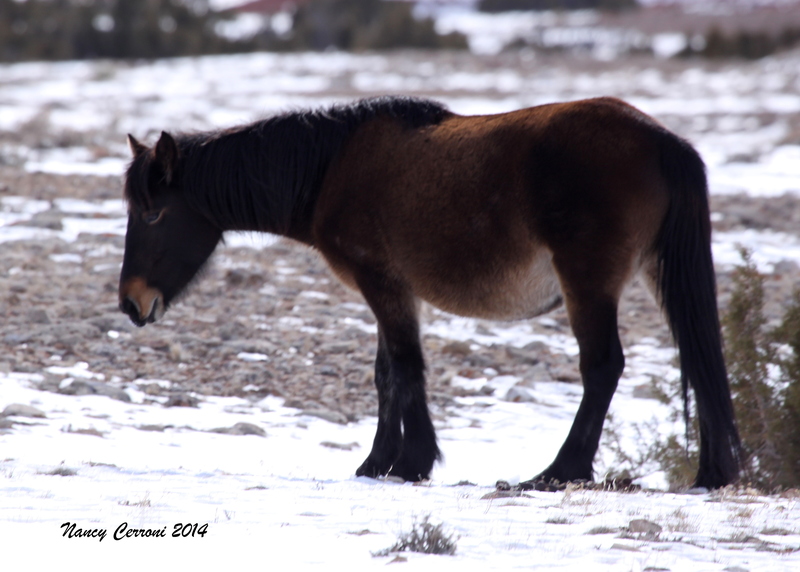 Several organizations have been out observing the horses this winter. This post will use the information gathered and reported by The Mustang Center, The Cloud Foundation, and Wild in the Pryors. A special thanks to Ginger and Sandy for providing this information on The Cloud Foundation newsletter and the Wild in the Pryors blog. 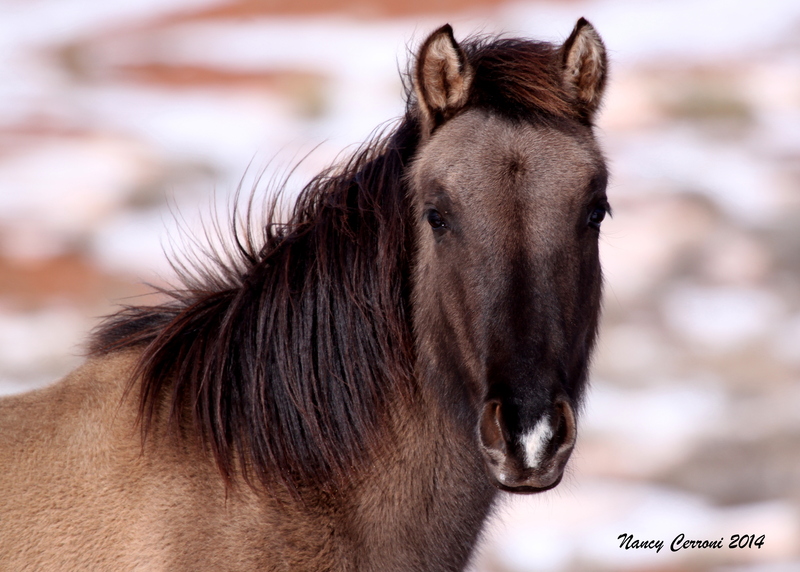 The Mustang Center has used their information, along with our own observations, to do an informal survey to determine the horses seen during these winter months. This post will report the bands of horses not seen. Typically we don’t like to make speculations about the horses, but this post does make some predictions on where the horses might be based on past winter behavior. Duke: Duke is a strong, bay stallion with a large band. During other winters he has been spotted in Area Q (aka Hell n Gone) and/or on Jim’s Farm. These are extremely difficult areas to access in the winter (or any time of the year for that matter). Chances are this is where Duke and his band are spending this winter. Gringo: Gringo has taken after his sire (likely sire), Duke, in color and strength. 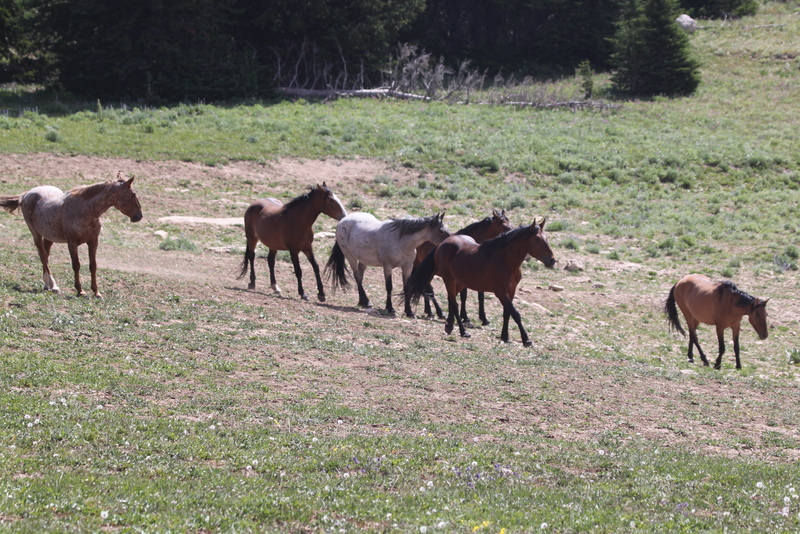 Gringo has assembled a band of mares including Jacinta, Beulah, Galadriel, and Ketchikan. Stallion, Tecumsah, kept close to Gringo’s band all through the summer.Since he grew up in Duke’s band, it may be possible that Gringo is in Area Q as well. Garay: Garay has been with the mare, Quelle Colour, and her 2010 filly, Kohl. 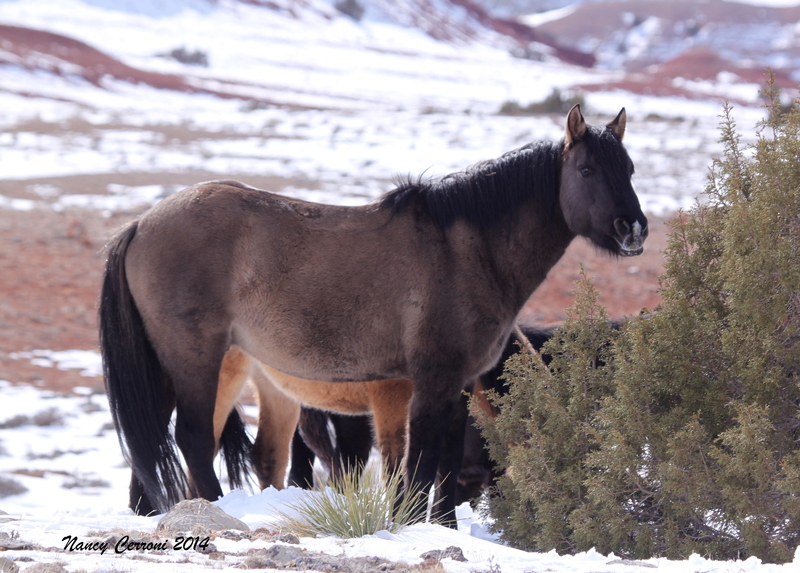 Garay is one of the Forest Service stallions that managed to move into the horse range before the rest of the Forest Service horses were removed. Quelle Colour is a seasoned mare and definitely has years of winter experience behind her. As a bachelor, we had spotted Gary in Area Q during the winter months. 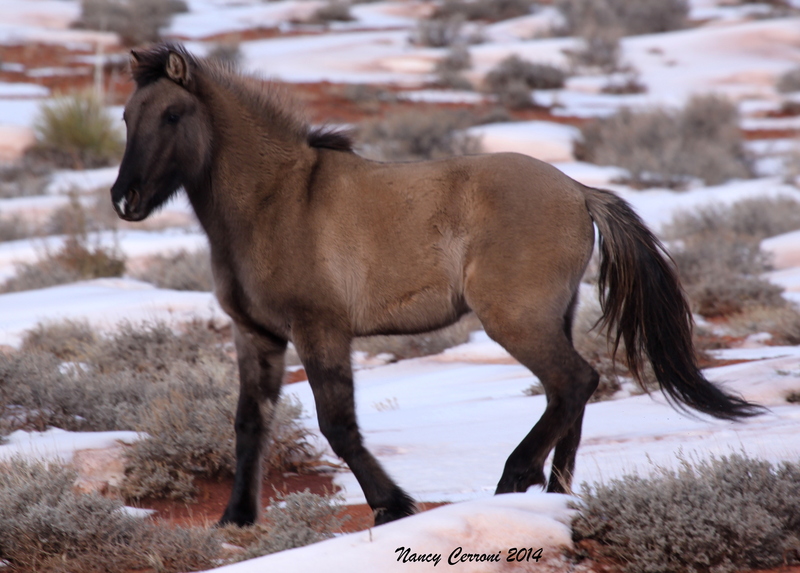 Horizon: Young band stallion, Horizon was last seen with Juniper, the buckskin filly, and older mare, Tonapah. Chances are Horizon is on Sykes Ridge. Fiesta and Horizon: Fiesta spent much of the summer close by Horizon and his band. Custer: This one I’m not 100% sure on. It seems that The Cloud Foundation saw him in early winter (maybe around November). We have not spotted him yet. 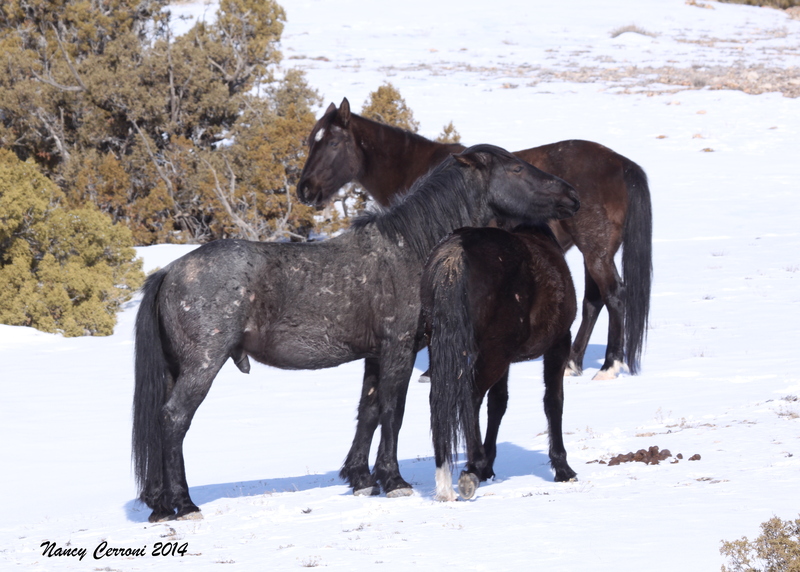 Last we knew, Custer had the veteran mare, Winnemucca and the young mare, Fiasco, with her 2013 colt, Nodin. 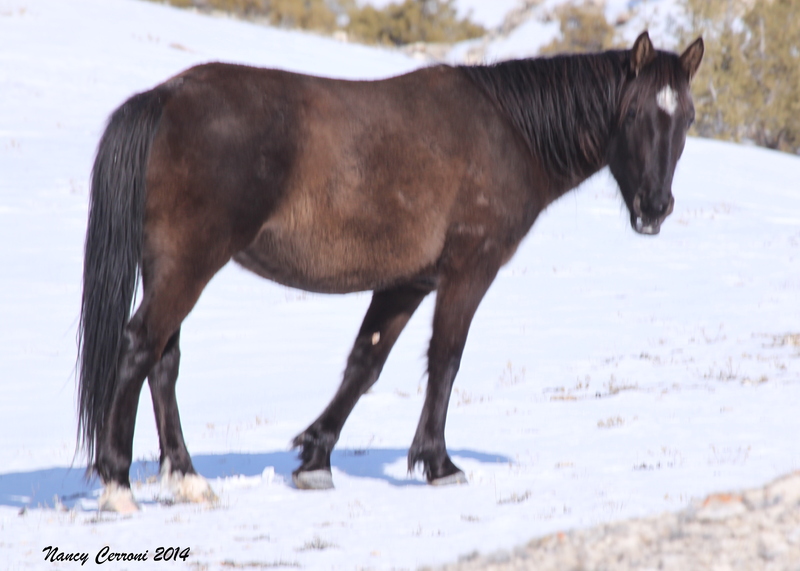 Winnemucca, born in 1988, will be 26 this year. In past winters, Custer has been spotted out on the big island in Big Coulee, Burnt Timber, or Sykes. As you can see, the majority of the bands have been spotted this winter. There has been some interchange, which is not highly uncommon in the winter months. A number of bachelors have been seen, but have not been included in this survey. 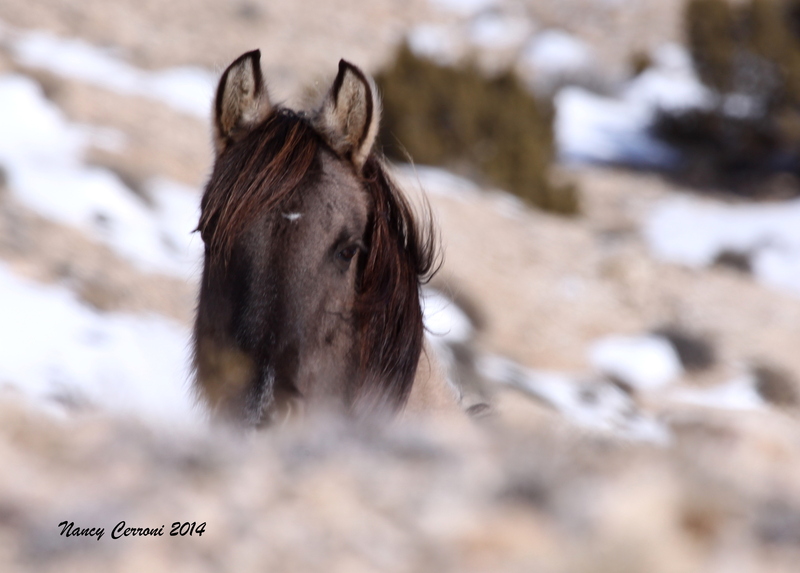 We will continue to monitor the range and will keep you posted about the herd dynamics. If you have spotted any of these bands during the winter months, please contact the Mustang Center through email or Facebook. It had been about a month since the last trip to Turkey Flats. Weather and circumstances of life had been hindering weekend trips. However today was a perfect day to head out with a bright blue sky, little to no wind, and temperatures in the 40s. It was the kind of winter day for peeling off layers rather than putting on layers. Most of the land has some type of snow cover of varying depths. Much of it was boot depth. Drifted snow and snow in the ravines was knee to thigh deep. 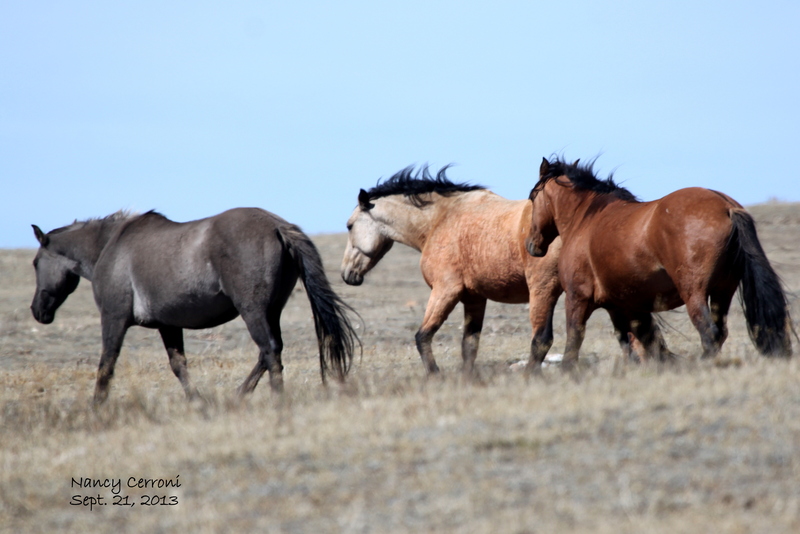 The horses were scattered and remote. 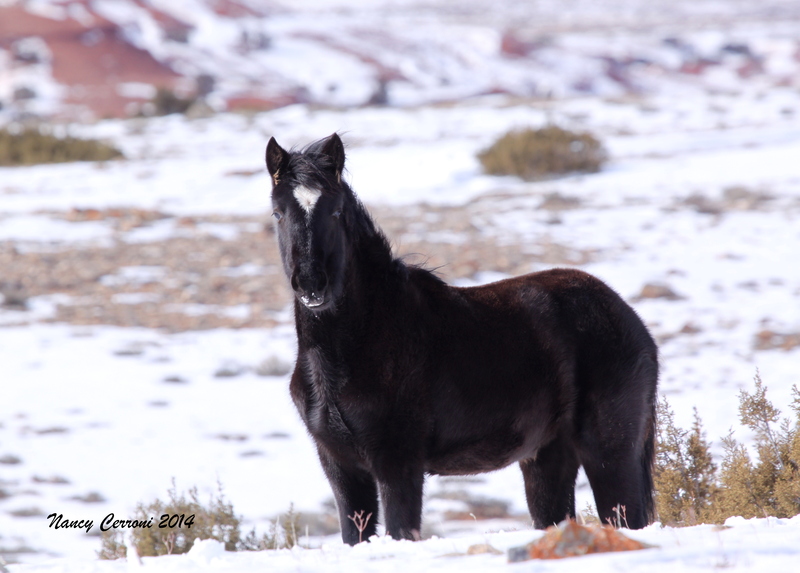 Between the snow and the locations of the horses, the hike was a challenge! 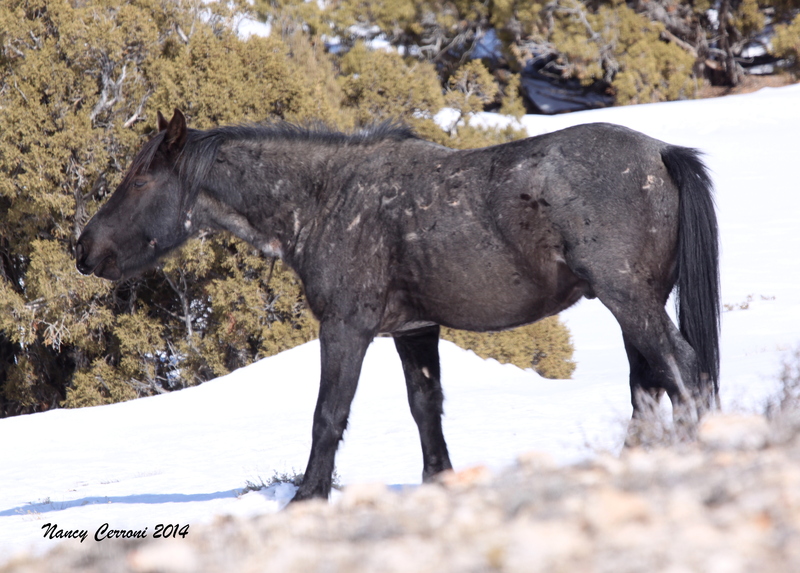 Turkey Flats in winter offers interesting wild horses. Today was no exception. It appears the horses were enjoying the warmth of the afternoon sun as each group rested quietly in their respective areas. Just south of the Red Hills, in a secluded area was the first band of the day…Sitting Bull. Years ago, Sitting Bull had had one of the most frequently viewed bands on the Range with his main territory right at Crooked Creek Bay. 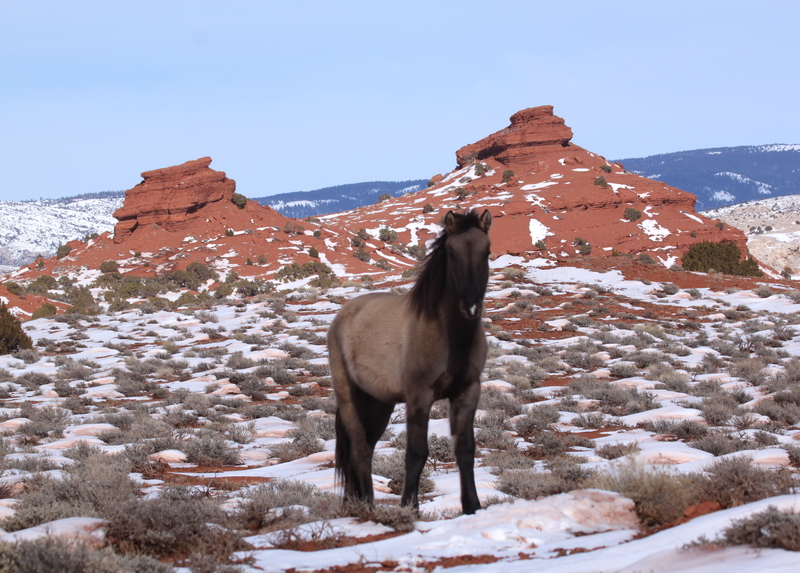 He, his mare, Cecelia, and their 2012 colt, Mato live an isolated life in the Red Hills area. 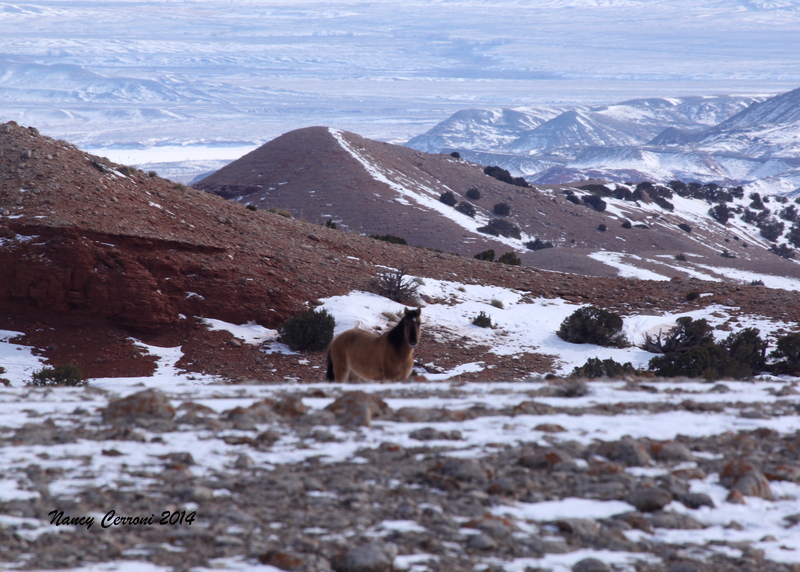 Mato and his parents, Sitting Bull and Cecelia were grazing and eating snow just south of the Red Hills. 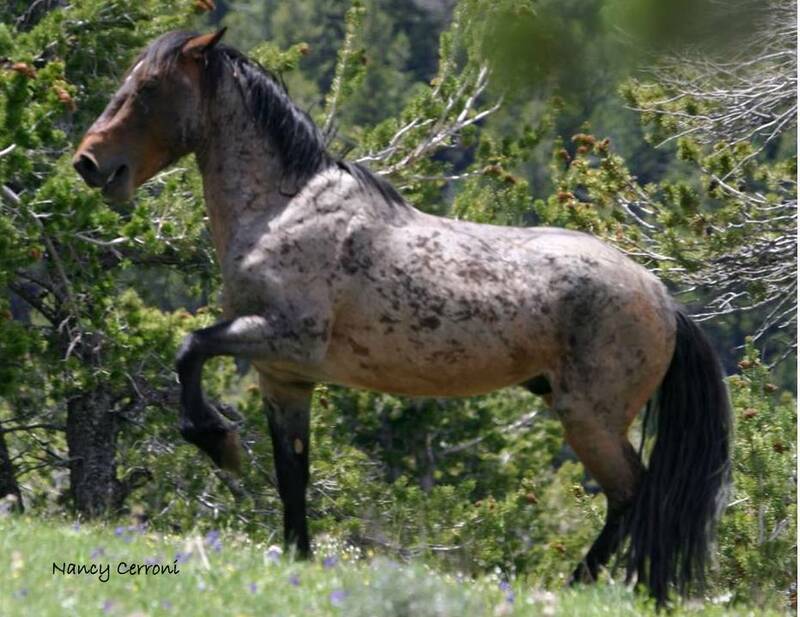 Mato, a coming 2-year old, is such a beautiful horse with his color and conformation. He has the natural curiosity of the young. Mato does have some soundness issues in his rear. He moves along ok, but has a noticeable “crow-hop” type gait. This may hinder his life as he moves into adulthood, however, it is part of the natural world. He is fortunate to be raised with such an elusive lifestyle. This may help him find a niche in the Pryor world, much like another stallion, Bristol, who has lived with his own soundness issues for many years. The trek continued up to towards the west side of the Red Hills. A high vantage point allows for a thorough sweep with binoculars of the area. Three bands were spotted…scattered far apart and in some rugged terrain. The first group was on a ridge to the west of Sykes Ridge Road. It was a pair of grullo horses which turned out to be Fresia and her 2012 colt, Montana. 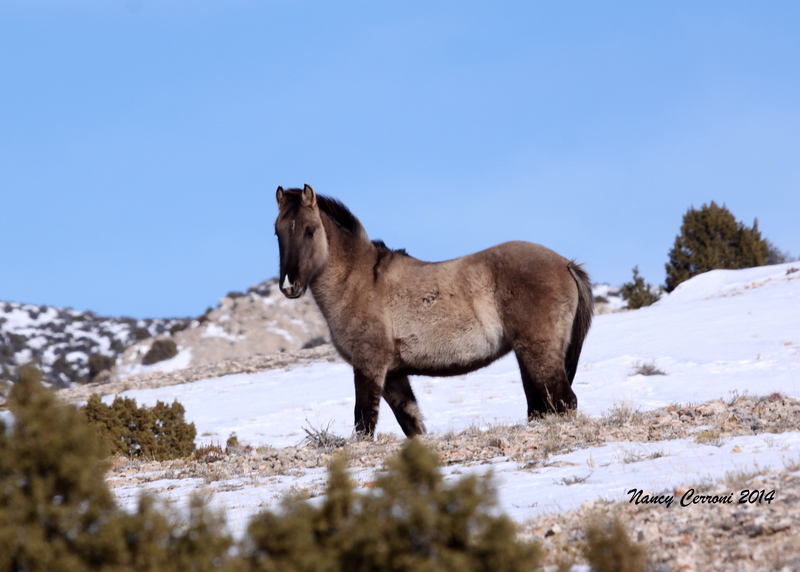 Montana was on the hillside, standing alone and grazing the sparse grass. A short time later, Fresia, peeked up to check out the intruder. She moved up towards Montana. No other horses were to be seen. 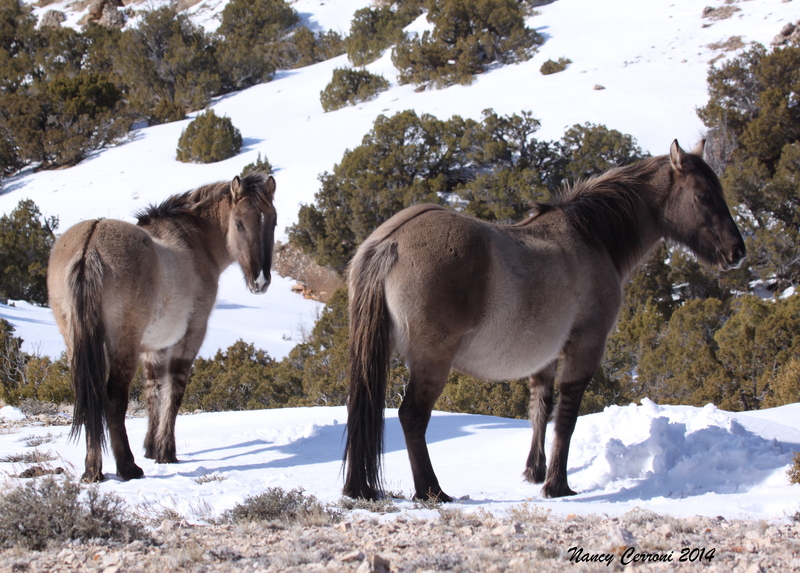 On December 26, 2013, these two had been with Hidalgo, Halo of the Sun, Jewel and her filly, Mercuria. A quick search of the area revealed no other horses. Fresia kept looking off towards the southwest and even called out. Montana is the spitting-image of his mother. 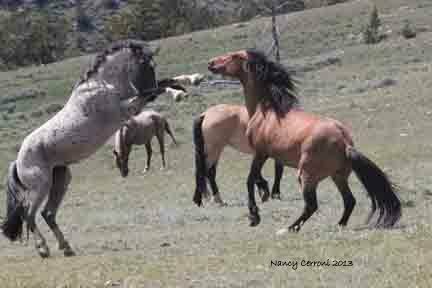 They both have a beautiful grulla/grullo color with distinct primitive markings. They also have a star and a snip. The ridge they were standing on dropped off into deep ravines, down one ridge was Hidalgo. His red dun color is unmistakable. He was resting on a slope right beneath Fresia and Montana. 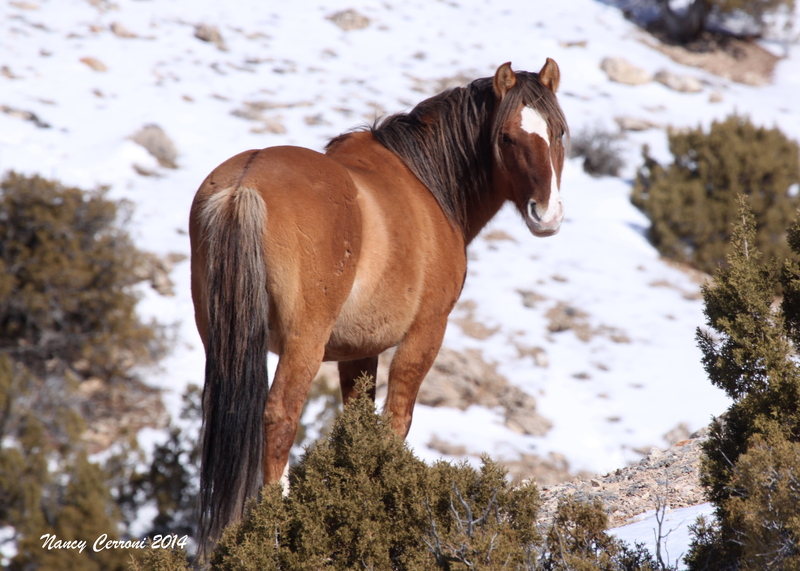 Unless the other mares were hidden deeper in the ravines, they were not with Hidalgo. He continued to rest the entire time he was in view. The next band was several ravines away due west of Hidalgo. It was Fools Crow. 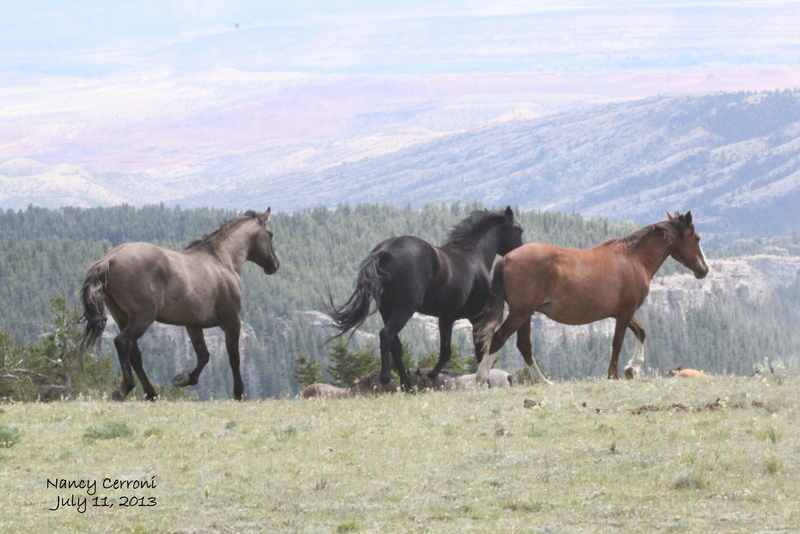 The last time Fools Crow was seen in this area, he had Belle Star, Icara and her 2012 filly, Morgana. There was no sign of Belle Starr. Fools Crow looked a bit roughed up and he moved as if he was sore. At first only Icara was visible. A short time later, Icara’s 2012 daughter, Morgana popped up from her rest. The band drew together. Fools Crow and Morgana engaged in some quick grooming. Again, unless, she was hidden, Belle Starr was not visible. Time will tell the story of where Halo, Jewel, Mercuria, and Belle Starr are. Interchange isn’t unusual for this group of horses, but at this point their whereabouts are a mystery. 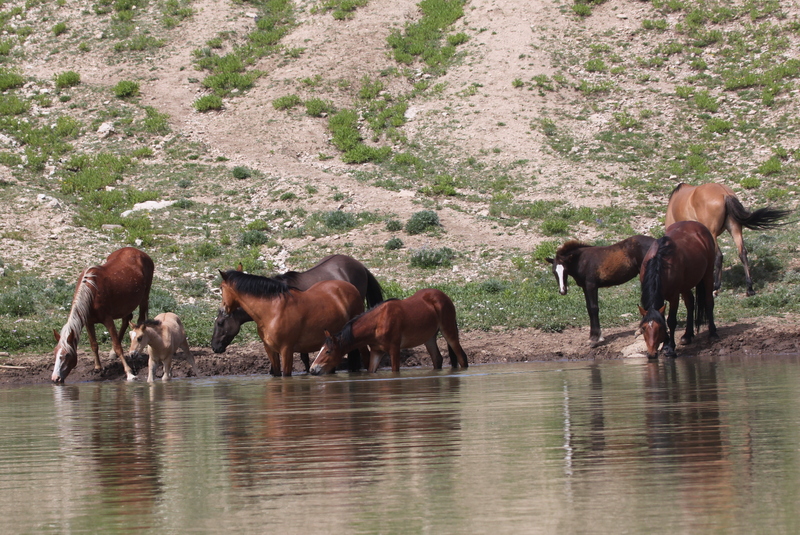 No horses were visible in the Big Coulee drainage. The last band of horses seen was a familiar group in that area…Garcia’s Band. At first they were all resting out in the middle of Turkey Flats. In time, they got up and moved to a snow drift which provides their winter hydration. 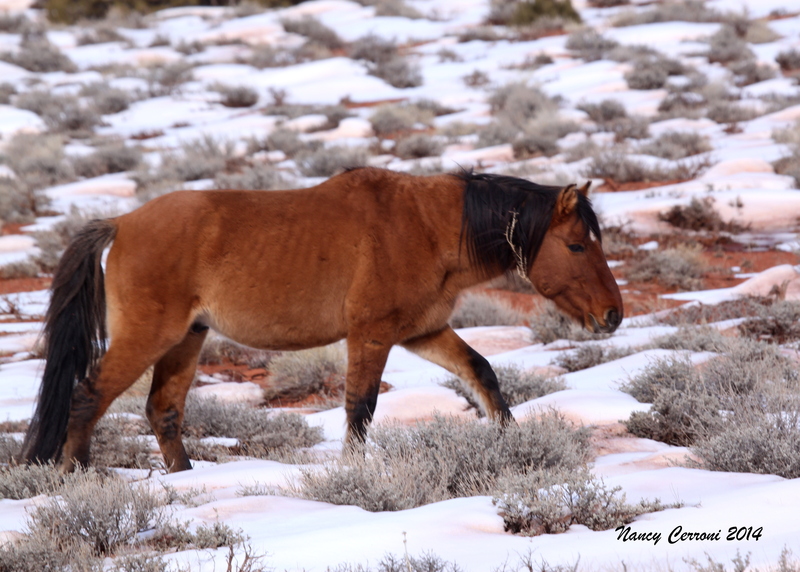 Millicent could be seen out in the middle of Turkey Flats. She is the 2012 daughter of Garcia and Greta. Greta is a shy horse. She is wary of human interaction so it’s especially important to let her have her space. Garcia and the fillies, Millicent and Norma Jean, enjoy the snow together. Norma Jean, born in 2013, is bold and curious! These four bands were all that were seen on Turkey Flats. For the most part, they looked like they were wintering quite well. We are very interested to hear if anyone else sees the missing mares. 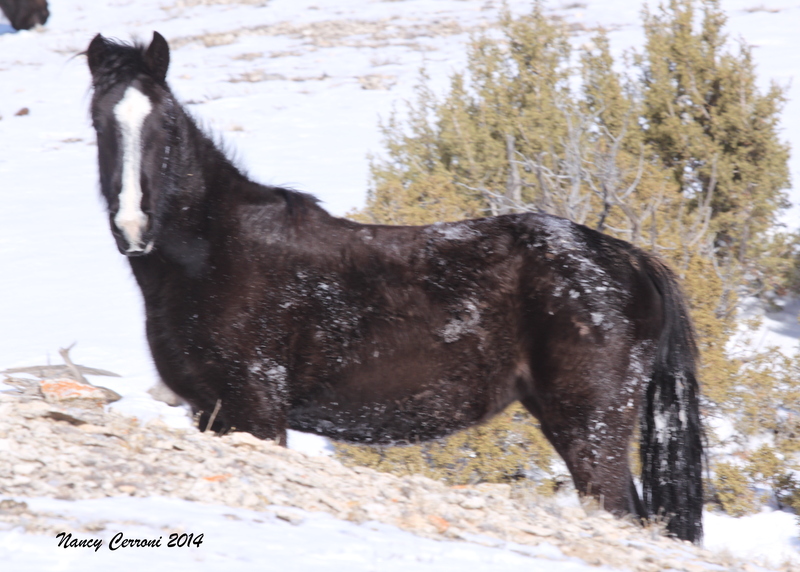 And we will post as soon as we get more information on them and other horses we spot.